As a general rule, Winter in So Cal means regular forays into the mid 40's if not low 40's overnight and then high 60's and low 70's for daytime. We also get 95% of our annual rainfall from november through March...maybe April. If that matches you, lets you know what will make your winters... on the other hand your overnight summer temps I suspect are MUCH higher than here! Ok that makes sense! We'll usually get one week of upper 70s/mid 50s and then a week of 60s/40s. We usually get 2-3 inches per month over the winter. The rain picks up in late May and is 7-9 inches/month over the summer with almost daily thunderstorms. That's pretty much the opposite of your rain pattern, 2-3 inches/month in the winter and 0.05" in the summer. According to Weather.com the Orlando rainfall and temperatures are pretty similar from Nov-Mar (probably 4-5F warmer here) but our summer is 10F warmer highs and lows and 100x the rainfall. South FL is a slightly different story, drier in the winter than Orlando with 2" per month rain and 77/57F average temps vs 70/50 here. The summer is about the same. In general, winters in the southern half of FL follow a similar pattern: Warm to chilly days, cool to chilly nights, sunny, little to no rain and lower humidity, brief showers in advance of a cold front dropping down from the north, followed by colder, windy and dry weather. Nights are coldest just before dawn but temps rebound after the sun comes up. We had a bout of one-off weather this past weekend when a winter front stalled over us and dropped 4+" of rain over a 24-hour period and temps never rose above mid- to high-50s. Then we had several days of no further rain but persistent clouds, north winds, highs barely or not reaching 60F and lows in the 40s. What that period cold and rain - not unlike what CA gets in winter - followed by sunless chill will do to my tropical palms and container garden I won't find out until weeks or months later. I had company this past weekend and elected not to haul my wet, chilled lanai container into the house. Maybe a mistake but I'll find out later. I've learned over the past 26 years in FL that the northern half of the State is under the influence of continental SE US weather, thus experiences more cold and, critically, much more winter precipitation. Early on, during road trips north to visit family, I noted that by Tampa north, vegetation changed from subtropical to typical SE US forest. We had a bout of one-off weather this past weekend when a winter front stalled over us and dropped 4+" of rain over a 24-hour period and temps never rose above mid- to high-50s. Then we had several days of no further rain but persistent clouds, north winds, highs barely or not reaching 60F and lows in the 40s. What that period cold and rain - not unlike what CA gets in winter - followed by sunless chill will do to my tropical palms and container garden I won't find out until weeks or months later. I'm already finding out Meg. Pulled a spear out of one of the stems of my Mauritiella armata, that's been doing well through our winters for years. It also looks very unhappy overall after this last rain. All brownish and yucky. Hopefully it will recover. I think PalmTalk needs an "unhappy" button. I'm with you, Alex. This afternoon I noticed my largest Pinanga bicolana seedling has that "damping off" look. I'm sure it's a goner and won't be the last. All it takes is one freak bout of wet, cold weather and tropical stuff starts keeling over. Except I don't use emojis - but I am partial to the seething, snarling, red demon. It speaks so eloquently. The report from the other thread certainly suggests that Hydriastele costata﻿ is more cold hardy than widely believed to be. It certainly looks uber tropical. I looked this one up just now, as the name was new to me. What a gorgeous palm!!! And yet I saw a posting that indicated the poster lost all five of his H. costata seedlings when the temp hit 50F. I agree it's a gorgeous palm but I fear a hopeless one for me (and gets 100' tall if it lives long enough. In other threads I read it took 38F with no burn in Ft Lauderdale, and routinely took 2-4C (35-39F) without serious damage. So it might just be that seedlings and germination is difficult and really cold-sensitive. Nothing more exciting than S. Texas weather...an icy afternoon below freezing (the "high" of 36F on 2/3 was the temp. at midnight...the afternoon high was actually 29F/30F) and 90F all in one month. Second half of February didn't even drop below 60F. Yes some coconuts and Adonidia survived this as well as royals and foxtails. Lytocaryum Hoehnei was a big surprise for me. Took 16F & freezing rain & fully recovered. My ptychosperma macarthurii surprised me last winter with no damage from ~27f. That palm is underrated for cold tolerance, there's a d lutescens in the same yard that was knocked back to the ground by comparison. Wow, I wonder if there was something unique about your palm. This is the first time I've heard this about the MacArthur palm. I see MacArthur palms everywhere down in Miami, but it never gets cold enough in Miami to test them. There was no damage that I saw. I planted it as a 3g and it didn't really grow much since. That's the only problem with them, they're slow. There is a big clump of Ptychosperma macarthurii east of Orlando near UFC at a hotel at Colonial/Hwy 50 and Alafaya. Its been there since the mid 1990s. It gets foliage burn in the upper 20s and it lost some stems after the 2009-10 winter. I also have a young one (3ft) at my house in Altamonte Springs. It had no damage after last years freeze. I had 27F in my yard but it is under tree canopy so saw a bit warmer. But it was windy and a 4ft Archontophoenix purpurea next to it had some burn. Way back in 1984 I brought a small specimen back from Miami and planted it in Orlando under tree canopy. It was about 2-3ft tall. Jan. 1985 the 2nd of the 3 record freezes of the '80s hit. It was around 20F/low 20sF for 2 nights. The palm froze and I thought it was dead but later that summer it grew back from the roots. After that it grew slow and only got to about 3-4ft. Then the Dec. 1989 freeze hit and it was killed, did not grow back. Ptychosperma macarthurii is a palm that should be grown more. It has been around in SoFL for many decades and you see it occasionally but it isn't grown by many nurseries now. Ptychosperma macarthurii﻿ is a palm that should be grown more. It has been around in SoFL for many decades and you see it occasionally but it isn't grown by many nurseries now. Mine went through 09/10 with no issues, as since seeded and I have several little ones now. I can't seem to find any info (apart from what Eric posted above) about the magic temperature that kills a MacArthur alm. Some palms are deceptively leaf - hardy, but not very bud hardy. Others are the opposite (they look dead after a freeze, but keep coming back). 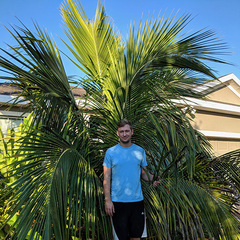 Palmpedia designates the MacArthur palm as "zone 10+" , yet even if it is really a zone 9b palm, it will eventually be killed up in northeastern Florida and I am losing patience with zone - pushing experiments, thanks to that bad January 2018 freeze (killed some of my palms). This is useful info anyway for others. Thanks for posting. I saw that MacArthur palm has a vast range of native habitats in the South Pacific. Are some subspecies more cold-hardy than others? Are the Australian ones more cold-hardy than those native to Fiji. I don't know, but perhaps someone's experimentation might be an indicator. Back in winter of 1995-96, there were several nights of temperatures between 28-30F from late Dec into Feb then one night at 26F in mid Feb. here at Leu Gardens. A 4ft P. macarthurii was killed to the ground but regrew from the roots. It is defintely a zone 10a palm and can grow in the warmest areas of 9b barring a 12/89 type freeze. I would say hardiness very similar to Dypsis lutescens, foliage maybe slightly hardier. I’ve seen Phoenix Canariensis survive brutally cold freezes while Butia ordorata was killed. In my neighborhood in dec 2010 in open unprotected positions, all adonidia and cocos died at 28F. Mature Royals foxtails, and Hyophorbe verschaffeltii on my block survived and grow today. Orlando area has a huge range of localized temps, especially high near the lakes. Unless a thermometer was placed near the plant the temps are unreliable in those places. Under canopy is typically warmer as is near a good sized body of water. I live in a warm 9B but we are going to change to 10a soon since we haven't seen a 9B winter in the last 8 years. But when one hits, I expect to see all those unprotected adonidia and cocos die like before. Adonidias are small and can be easily replaced, but I'm not interested in disposing of a big dead coco. I have 3 maturing B alfredii instead, and don't miss the coco look at all. What's the coldest you've seen CIDP survive? If Pritchardia hillebrandii (a coastal and lowland species) is a candidate, then many Pritchardia species that occur at or around 4000' elevation should have potential. In order of elevation height on Kaua'i, highest is P minor, flynnii not far below, hardyi and waialealeana in the clouds too. Each island has awesomeesic species. I would not plant a CIDP in places which get temperatures below 20 degrees Fahrenheit, unless it happens only sporadically (not every year). Last February, we recorded our coldest temperatures in 20 years with a one-off low of 12F. I had two CIDP's in pots on my patio, next to the house. One of the CIDP's was barely fazed by the 12F and only had some minor bronzing on its fronds. No spear pull and barely any visible damage. It took the 12F like an absolute champ, considering it was in a pot as well, with the roots above ground. It was barely affected. With growth resuming the following month, it soon looked 100% again. Whereas the other CIDP on my patio was completely defoliated by the 12F, and it took forever to recover and start growing properly again. Even today, 11 months on, it still looks pretty darn bad and only has half a crown. And that is after a long, hot summer. I thought that CIDP was dead initially, around March time, so I moved it to the bottom of the garden (out of sight - out of mind). I have left it to its own devices, but I suspect the next big freeze may finish it off, whether that is this year, or next. It is clearly weaker and more susceptible to cold temps than the other one. But nonetheless, it is still trooping along. Anyway, it seems that hardiness can vary dramatically between individual specimens. Both of them are pure CIDP, with no hybridisation. They are both the same size, came from the same seed stock and were situated in the same location during the cold spell. Yet one clearly fared better and has superior cold-hardiness. Location:Carambeí-second tableland of the state of Paraná-south Brazil. I 'ḿ trying P. minor here. Fingers crossed. Those highland Pritchardias are nice, but they generally don't do well in Florida because of our summer heat. I've had good luck with P. beccariana though, which can be found at the 4,000 foot mark, but it apparently used to also be found at sea-level, so that probably helps. We've had a Ptychosperma lineare in-ground in our borderline 9b/10a garden in Sarasota approximately 7-8 years. It is 25 feet tall now, full and beautiful. It is adjacent to a number of other tall plants/trees, but no direct overhead canopy. It has a huge mahoe to its south, which gives it significant shade and protection. Although it didn't go through the 2009-10 winter, it has seen an occasional 27-28 degree night with warmup the next day. It has never had any cold damage nor shown any problems/stunting during the winter. I don't know if it could be a little hardier than macarthurii? In any case, in our opinion, it's definitely worth a try in borderline 9b/10a in a relatively protected area or under canopy. One of our favorite palms here. P minor was the most abundant Pritchardia in collections in relatively cool areas of New Zealand around Auckland when I visited last year. I’ve found P hillebrandii doesn’t mind our cool winters in Melbourne as long as they are protected from frost but haven’t had the chance to try any others yet.